Here's my card for the current challenge at CAS Colours and Sketches. I paired the sketch with a sweet image from the Lovie Friends set from Lil' Inker Designs. I colored the bear image with Copic markers and cut the image out with the coordinating die, then used foam tape to adhere the image to a cream cardstock panel. To go with the love themed image, I trimmed down a scrap of red "xoxo" patterned paper. After matting both the patterned paper and image panel on red cardstock, I adhered the panels to a kraft card base, angling them in opposite directions. 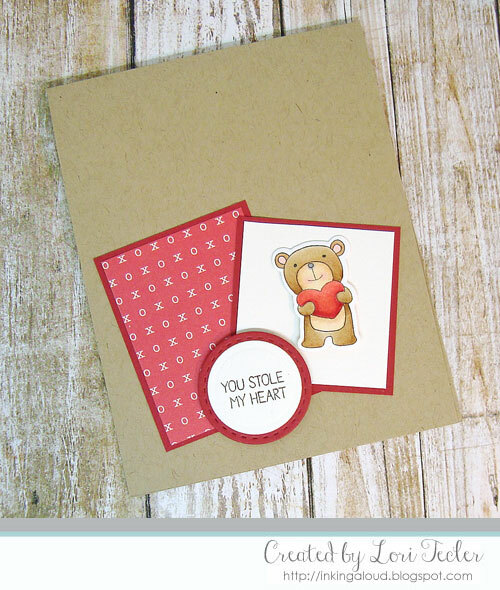 I stamped the "you stole my heart" sentiment on a cream stitched circle die cut and matted it on a larger red circle, then placed it on top of the two panels using foam tape for dimension. Oh my is this ever cute, the little bear is darling. Thanks for playing along with us at CC&S. What a sweet little bear! The kraft, red, and white color combo is always a winner. Thanks for sharing your adorable card with us at CC&S!